This video will walk you through playing Taka Taka Stop Stop in its entirety. Once you can play the whole song, try playing the same notes with the other Twinkle Variation rhythms. The notes for the whole song can be divided into three parts. Taka Taka Stop Stop is the first of Suzuki's Twinkle Variations. I made this video to show students how to play the first part of the song. All of the variations have the same notes; the only thing that makes them different is that your bow plays a different rhythm on each of the notes. Believe it or not, everyone can dance! You can dance and move to music with your child! Listen to some stimulating music and start swaying back and forth. Then move your arms in a waving motion or make large and small circles. Next pick up your feet. Step side to side. Add a few kicks. Walk in a circle. For extra pizzazz add some dancing ribbons. 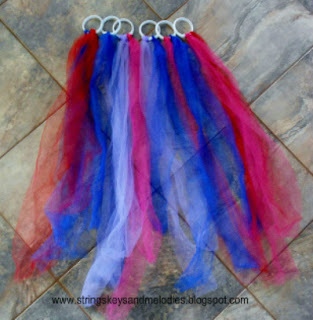 Dancing ribbons are so popular with my students. Every week they beg to use the ribbons. The ribbons turn every song into a special event. The handles make them extremely easy to hold. 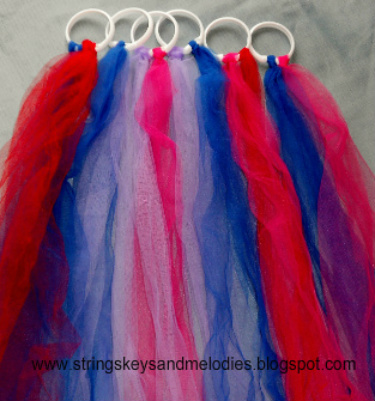 Ribbon, tulle, or caution tape cut into 40-60 inch long strips. Tie and knot 2-3 ribbons to each shower curtain ring. They will hang down doubled so you will have 4-6 ends hanging off the ring. Now put on some music and get moving! The very first songs Suzuki violin students learn are the Twinkle Variations. The five variations are Twinkle, Twinkle Little Star played with different rhythms. Here is a video I made that shows how to play the rhythms of the five variations on the "A" and "E"strings. 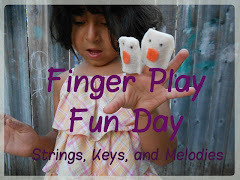 Beginning students can watch this and then practice the rhythms on their open strings. The first step is to learn the names of the keys! Watch this video to see a few of the easy songs we use to practice the note names. Play the keys and sing along too! I have made a video to help those students who are learning Star Wars on the piano. *Remember the ties mean you won't play the note again but will continue counting. *And get your left hand ready to reach for High C and put it back again to play in its regular place. Watch the video and then go practice! Did I just make the grocery clerk angry? To read these people’s emotions, we need to look at their facial expressions, body language, and tone of voice and feel the tension in the air. It takes a combination of insights to accurately read how a person is feeling. Some children are really good at seeing how people feel and other children walk through life unconcerned about anyone else’s emotions or feelings. Using music is a great way to practice social reading. Music conveys emotions and feelings and we can make a game out of figuring out what the music is trying to tell us. Does this song sound happy or sad? Put on some music without lyrics and ask how the music makes you feel. Music is full of complex emotions and is a great place to start. Either simply listen to the music or have your child act as the conductor as you play the music. Explain that the conductor doesn’t dance but helps the musicians know what emotions and feelings the music is conveying. Just like our tone of speech tells if we are happy or sad, the key the music is written and played in tells if it is happy or sad. Major tones tend to be happy and carefree. Minor tones are often heard as sad and gloomy. Is the music fast or slow? Is it happy or sad? Is it bouncy like a rabbit or flowing like an ice skater? Is it loud or soft? Is it peaceful or agitating? Is it soothing like a lullaby or upbeat like a marching song? Classical music is full of emotions, changing from one emotion to another and then back again. See if you and your child can follow these emotional changes. In the beginning you should point out these feelings and then after some practice your child might start understanding and pick up on the emotions himself. 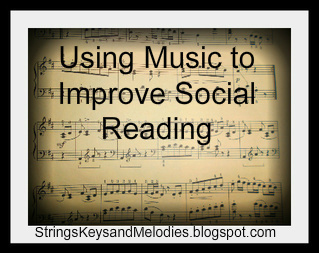 Music is a great tool for teaching and practicing social reading. With some practice your child will be able to better understand the people around him. Haydn’s Surprise Symphony – loud and soft and full of surprises! Vivaldi’s The Four Seasons – Can you pick out the seasons by the music? 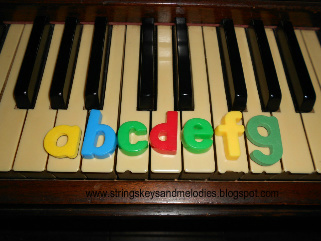 Instead of using plain flashcards, quiz beginning piano students the names of the keys by having them place little letters on the keys. *Start with C and let them use that as a reference point to add the others. *When that is easy, try doing one key at a time, taking the letters off as you go. 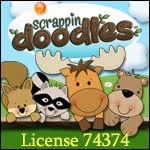 This is much more fun than plain old flashcards! Use this video to help you practice "Animals at School" aka "Mary had a Little Lamb"
Watch the video and then go to your keyboard and try it on your own. Come back when you need to watch again! Let me know in the comments if you like this video. Thanks. "C" Position is a little different than "Middle C" position. Now you are set to practice your songs! Drumming and tapping out the beat is often our first response when hearing a song. A catchy tune plays on the radio and our fingers start rapping on the steering wheel. We can feel the rhythm. Rhythm is a part of who we are. That is why drumming can be so much fun for children. They love to tap away with rhythm sticks or pound with their hands on a drum. Not all children can feel the beat. For these children you will need to tap the beat on their lesg or backs. They need help translating what they hear into what they feel. Practicing rhythms at home can be very inexpensive! Rhythm sticks can be found for a few dollars a set. I have even used unsharpened pencils when sticks were unavailable. Thighs make great drums! I really enjoy the sound of hands on thighs and they don’t cost a dime. Just don’t tap too hard! Empty oatmeal containers, large (not individual size) yogurt or margarine containers with lids make great drums. You can even decorate them! Pots and pans can be noisy but fun! Be careful what you pick. My stainless steal bowls don’t look smooth and pretty anymore! Put on a CD of any type music (except chanting and New Age relaxation music) and find the beat! Below is a video I made with my daughter playing The Drum Song. So get out your yogurt tubs and follow along! I love this quote. It makes me think of a perfectly happy child spinning in circles as she is singing and dancing barefoot in a field of green grass and wild flowers with an orchestra of musicians playing beautiful music for her. Wouldn’t that be the ideal way to learn? Carefree and happy. Unfortunately that is not the way it usually works out for our children. So many of my students have a hard time listening. Some can’t hear well. Some have trouble processing the information that is spoken to them. Some are so easily distracted they can’t pay attention to what is being said because they are off doing something else. This week I was reading a book that explained that some children can’t process information when it is spoken to them. But when the same instructions are sung to them, they are better able to understand and follow through. Children with attention problems often have hearing problems. 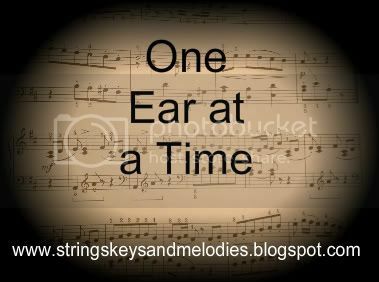 And it is possible that one ear is better at hearing than the other. So you need to speak or sing into each ear, one at a time. In one of my singing classes, there are a couple of 7 year old girls who have a hard time paying attention. I know they wait all week for singing class. They love singing and learning new songs. But when they see each other they can’t keep their hands off each other and start doing cartwheels and pulling on each other for the entire hour. Now, in my classes we start off with a lot of moving and dancing. So I am not expecting them to sit in chairs and pay close attention. I understand children need to move and stomp and feel the rhythms with their entire bodies. But when it is time to sing I still want them to sing. Instead of watching them do random movements such as cartwheels and flips, I initiated the movements for each voice warm-up. During one warm-up, we held hands and swung them back and forth to the beat. The constant movement helped them pay attention to their singing. During other warm-ups, I walked around the room bending down and singing in each girl’s ear. This worked like a miracle! One student, who always sings too high, off pitch, matched my voice as I was singing in her ear. It got her attention and she was able to hear my voice and sing on pitch. I continued singing in their ears, going from one ear to the other so that both ears got a chance to hear my voice up close. I loved how easy it was for them to then sing on pitch the rest of the class time. This week, I also tried singing instructions to my classes instead of just saying them. It did get the children’s attention faster and they were quicker to jump up and follow me to the next activity. I decided to try the ear experiment at home with my 4 year old daughter. She has a hard time saying some of her sounds. We have been working on the” th” sound for words like the, that and this. I leaned over close to her ear and sang “the” to the tune of “Mary Had a Little Lamb”. Then I leaned over to the other ear and sang the same thing. When I was done I asked her to say “the” and she said it exactly how she heard me say it! It was wonderful. She has not continued to say “th” sounds correctly in her regular speech but when I chant them in her ear she will say it correctly. So she can do it! She just needs to keep practicing and hearing it clearly spoken to her. Some children have a hard time listening. Some can’t hear well. Others have a hard time processing what is said to them. Some are easily distracted. One way to help these children is to sing to them, one ear at a time! Wouldn’t it be a wonderful world if everyone sang to their children as they gave directions and taught them new things? Our children could be dancing and singing as they were learning. A lot more happy and carefree!